Apple iPad, which was announced earlier this week received a mixed reaction from all over the world. Some found it as an oversized iPod touch, while others thought that it has the potential to redefine the way we will use our computers in the future. In a nutshell, iPad is indeed an oversized iPod touch/iPhone except for iBooks Store and iWorks Suite of apps. 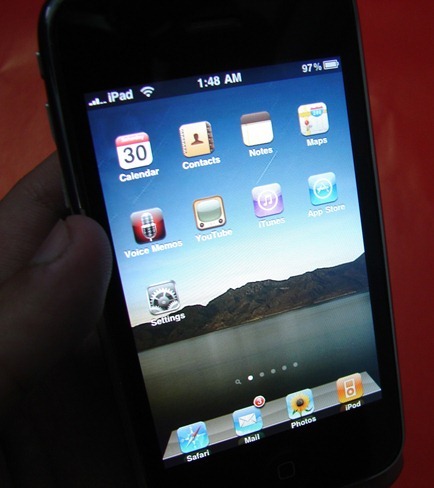 Since iPhone, iPod touch and iPad uses the same OS (iPhone OS), the look and feel is generally the same throughout the three iDevices except for the few tweaks here and there in the iPhone OS 3.2 running on the iPad. Now if you want to make your iPhone and iPod touch to look exactly like the iPad, simply follow the steps as shown in the video below to get the same lockscreen and springboard background, carrier logo which reads “iPad”, an iBooks like app, New York Times reader, the entire Kindle books catalog and much more. You will need to have a jailbroken iPhone to get it all to work. Follow the instructions posted here to first jailbreak your iPhone if you haven’t already and then download and install the following in this order. MakeItMine app via Cydia to Change the Carrier logo to iPad. More details here. Shrink app via Cydia to reduce the size of all the icons on the springboard. ProSwitcher via Cydia for Multitasking. More details here. Here is the video, showing each and every step in detail on how to turn your iPhone and iPod touch into an iPad. You can ask me any question should you run into any problem getting all this to work on your iPhone and iPod touch. Credits: Rorypiper for “Simple iPad Theme” and “Classics” app tip via ProgrammerFish. You can follow me on twitter or join our facebook fanpage to keep yourself updated on all the latest from iPhone. Awesome post Taimur. I don't see why people would wanna have the actual iPad when they can actually perform almost everything (and much more) on this one. I tried this but the app that shrinks the size of the icons doesn't seem to be for free. I do not understand why the icons need to be shrunk, & why we can't ad a 5th row down & across, why the carrier needs to be changed to iPad, & proswitcher shows an option for 3 active windows yet more were shown in the video. How does it decide which windows to “leave open” for switching? I'd love to have at least my mail, safari, the phone & a couple of other apps “ready”. Other than that, nice write up & video! Where can I find that cubed screen saver? Make sure you have apt.modmyi.com repo added in your Cydia sources. where do you get that initial cube screen saver? i know this question has been asked already but no answer yet. would appreciate one. I got it from “Backgrounds” App. It is available in App Store for free. Any chance there is a yet unannounced hidden front-facing camera behind the glass that will allow video conferencing in the future iPad OS? I feel like i searched the entire backgrounds app, and still cant find the cube wallpaper. Is there anyway you can give me a search name for it? or post it? Would be MUCH appreciated, and awesome work! When i install Winterboard it asks me to connect to itunes and then i have to restore…. i cant install it???? en cydia no lo encuentro, lo veo en Roca pero me da error siempre, hay alguna otra Manera de instalarlo? What about the search bar? Can you make it say “Search iPad”? It is time to change my iPhone to iPad it has lots of features added and very unique design themes. This is really awesome. I cant wait to have the FastMall iphone app on the iPad. What icon percentage am I supposed to use? Or which is the best? Can you make my iPod Touch screen larger? Rather than naming it iPad, I'm naming mine iPad mini – preempting the day when Apple releases a mini pocket size version of the iPad. if i click restore on my iphone will it mess things up? because my phone isnt turning back on and it was after i installed winterboard. How do I now get books into the ipad book shelf on my iphone? I am getting the same issue when I install Winterboard. It won't reboot and I have to restore.. Happened twice now. Anyone know what the issue is? I found a solution, if you use blackra1n, just make it rain again while its in recovery mode after installing winterboard. it worked for me. how did he do the multitasking thing?? ?